Fabless semiconductor vendor KaiSemi Ltd is boosting its efforts to provide drop-in replacement chips for ASICs and FPGAs whose manufacturing is due to be terminated (end-of-life). KaiSemi’s End-of-Life solution is based on KaiSemi’s proprietary conversion technology, which is able to automatically convert any FPGA or ASIC chip into a functionally identical ASIC device. 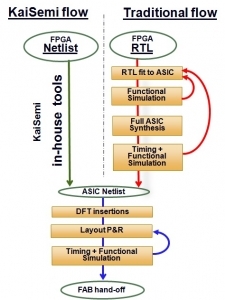 KaiSemi receives the customer’s netlist and converts it quickly and automatically into a functionally identical ASIC netlist. KaiSemi eventually proceeds to tape out, manages the entire manufacturing and shipping processes and provides the customer with a functionally identical, drop-in ASIC replacement chip, within up to 20 weeks. KaiSemi's technical breakthrough is an automated conversion tool and process which were developed by a team whose track record includes more than 500 successful conversions. The unique in-house tool performs an automated conversion directly from the original netlist into a functionally-identical ASIC gate-level netlist, using a large preinstalled embedded database of various fab processes and libraries. The technology enabled KaiSemi to approach companies in America, Europe and Asia with a risk-free full turnkey ASIC solution, which requires no engineering resources on behalf of the customer (Zero NRE). "As process geometries become smaller, and the lifecycles of products and technologies become shorter, more hardware companies face end-of-life problems”, said Tomer Kabakov, VP Sales and Marketing at KaiSemi. “This is where we can provide KaiSemi’s support. We are able to supply a pin-to-pin, functionally identical ASIC chip, based on the netlist of the obsolete component. The KaiSemi flow is automatic and transparent to the customer”.